Entrusted Property: napiraiz #072 + Happy Valentine's Day! Well, technically it is still Valentine's Day in Hungary, sorry if you're in a different timezone... Actually, what is time for a Doctor Who fan anyway! Right?! Actually they had a live chat on youtube today which I happened to miss, I leave it to you to point out the irony of it. What? What that you ask? 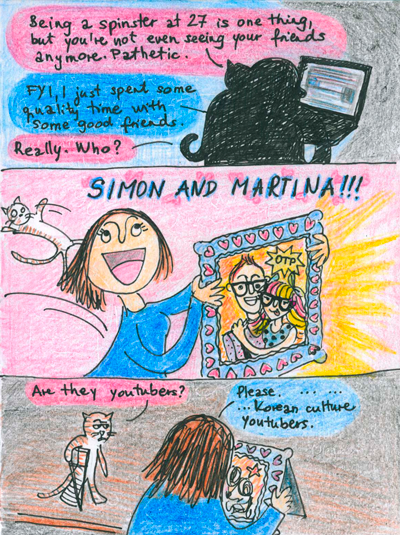 Who are Simon and Martina? Seriously. Have some culture! – 27 évesen vénlánynak lenni egy dolog, de már a barátaiddal se találkozol. Szánalmas. – Ha tudni akarod, épp most töltöttem minőségi időt néhány jóbarátommal. – Ugyan kérlek. … … … Koreai kultúra-youtuberek.